Our delivery zone covers wide area from Let Them Eat Cakes, in Swanley and includes Kent, South Essex (Grays, Rainham, Dagenham, Romford), Medway Towns (Gillingham, Chatham, Rochester)and South London. This covers areas such as Sevenoaks, Orpington, Maidstone, Gravesend, Dartford, Bromley, Bexley, South London. 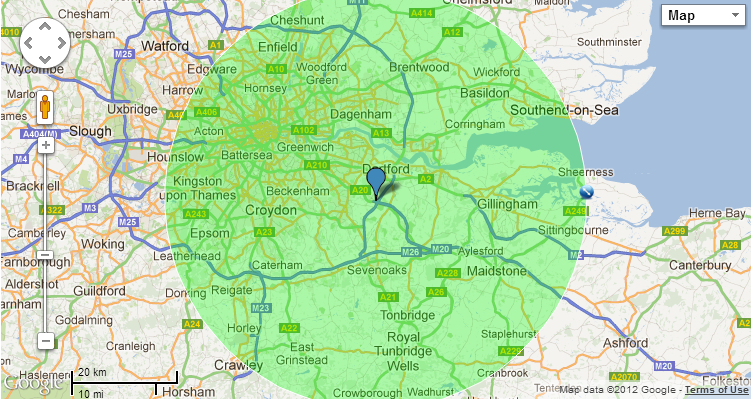 The green zone above shows where we deliver to. Outside of peak season we maybe able to deliver further so please do contact us to ask if we can.